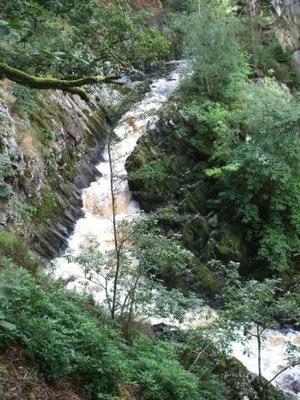 The Conwy Falls (or Rhaeadr y Graig Lwyd in Welsh) can be found alongside the A5 road just outside of the town of Betws-y-Coed in North Wales. 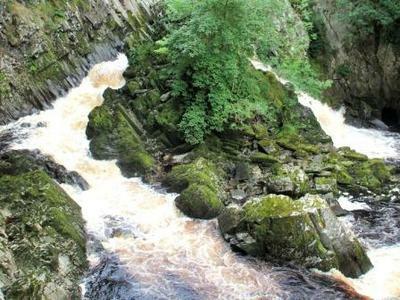 Here the River Conwy is squeezed into a dramatic steep wooded gorge and plunges 50ft (15m) split by a large central rock island. From the café car park a small fee is payable to enter the woods which are designated as a Site of Special Scientific Interest due to their flora and fauna. Natural paths lead down to viewing areas. 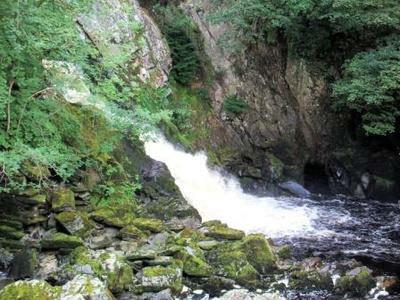 This is a river famous for its salmon and the remains of a 19th centuary fish ladder can be seen on the central island. In 1993 a new state of the art fish pass was built in a tunnel through the hillside at a cost of £1m. The colour of the water which looks like beer is due to the high Peat content in the surrounding soil.